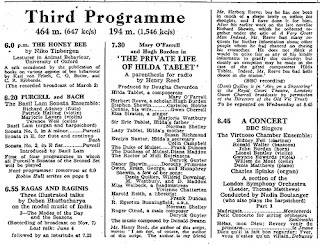 The BBC Third Programme offered listeners a rich diet of drama, classical music, concerts and talks but there was little in the way of a light repast. "Is it too much to hope," asked Alan Pryce-Jones writing for the BBC Quarterly in 1951, "that to all the other pleasures of the intelligence may be added during the next five years a more frequent experience of the intelligent chuckle?" Comedy on the Third offered nothing in the way of belly laughs and recordings with a live audience. 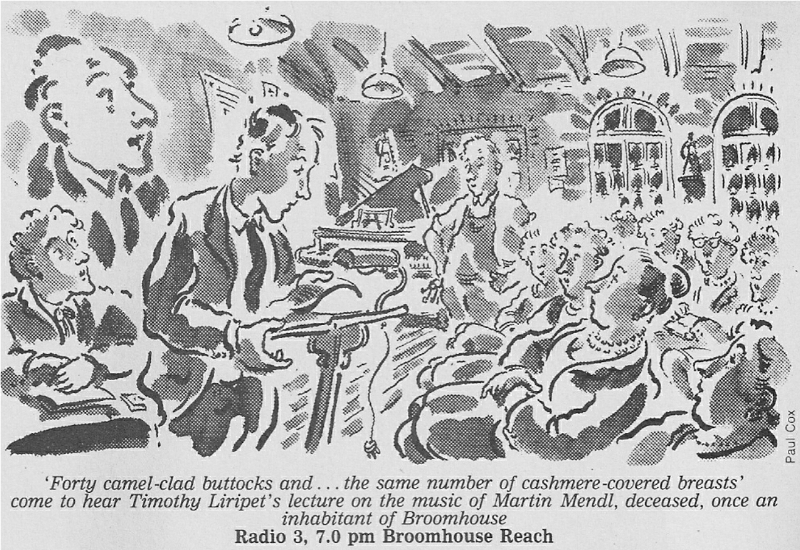 Indeed, as the then Controller, John Morris, observed in 1956 "it has been known for a listener to complain of the introduction of humour into the Programme". But humour there was, mostly of the "intelligent chuckle" kind. Trawling through the BBC Genome site it is possible to pick out a number of comedy programmes that graced the schedules of the Third Programme and Radio 3. I've already written about the programme that launched the Third Programme on 29 September 1946 and the occasional series of How to programmes that followed. The Private Life of Hilda Tablet (1954) was a supposed investigation into the life of composeress Hilda Tablet from the pen of Henry Reed. Hilda had first appeared in Reed's 1953 play A Very Great Man Indeed billed as a mock-solemn account of a critic's research into the life of an imaginary novelist named Richard Sherwin. Hilda Tablet, played with masculine gusto by Mary O'Farrell and her companion the soprano Elsa Strauss (Marjorie Westbury) were supposedly a spoof, all played deadly seriously, on the composer-singer ménage of Benjamin Britten and Peter Pears. However, is seems that Reed modelled them on composer Elizabeth Lutyens. So obvious was the connection that Lutyens and her novelist husband Edward Clark talked of suing Henry Reed. The part of Henry Reeve, the critic whose voice is central to each of Reed's plays, was taken by Hugh Burden. Other characters were played by members of the BBC Rep including Carleton Hobbs, Norman Shelly and Deryck Guyler. Subsequent plays were: Emily Butter - An Occasion Recalled (1954), the occasion being the first performance of Hilda Tablet's opera; Through a Hedge - Backwards (1956); The Primal Scene, as it were (1958); Not a Drum was Heard (1959), being the war memories of General Gland as played by Guyler; and finally Musique Discrete (1959). Recordings of all the Henry Reed plays are on YouTube. This is one of the great missing radio series as sadly no recordings exist. This 1949 comedy, a follow-up to the 1948 Home Service comedy Listen My Children, had a pre-Goons line-up that included Peter Sellers, Harry Secombe and Michael Bentine as well as Benny Hill, Robert Beatty, Benny Lee, Patricia Hayes and Carole Carr. The scripts were by Frank Muir and Denis Norden. Interviewed recently about The Third Division Norden said: "We weren't given much guidance what the BBC wanted except that it shouldn't be like the Light Programme or the Home Service. It was a revue, to use a slightly old-fashioned term: we had two bands to provide the music." Frank Muir, writing in his autobiography A Kentish Lad, recalls that he and Denis Norden "wrote a spot for Peter in Third Division; he played all the street traders in what we called Sellers' Market. We also used his extraordinary gift for character voices in sketches, one of which was a parody of those Fitzpatrick Traveltalks which seemed to be a part of every cinema programme in those days ('...and as the sun sinks slowly in the west we bid farewell to Bali, Isle of Enchantment...'). We called our version Bal-ham, Gateway to the South. Peter was very quickly taken famous and was persuaded by George Martin (whom later produced the Beatles' records) to record a comedy LP. Peter asked us if he could include three of our sketches which he had enjoyed performing: the mad headteacher of a progressive school talking to a timid potential parent, an interview with a moronic pop star and his gaoler/manager ('Come back here! I've told you repeatedly, where the carpet starts, you stop! '), and Bal'ham, Gateway to the South". 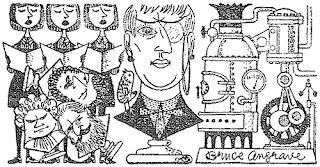 Muir goes on to say how some forty years later a group of Balham businessmen decide to spruce up the centre of the neighbourhood and, in the belief that the sketch had put Balham on the map, decided to erect a statue in the likeness of Peter Sellers. Anxious to affirm their copyright Muir and Norden wrote a light-hearted letter of retort staking their claim and suggesting that the group would now "involve itself in the expense of putting up two statues". Offering a compromise they said that "for a trifling sum, we would be prepared to go along to the new shopping centre and stand there personally". This was a one-off programme on the Third Programme's tenth anniversary in which Peter Jones and Peter Ustinov "pay homage to their betters". Based on the successful Home Service series In All Directions. This is the other Third Programme comedy that has failed to survive. Tantalisingly it's a 1964 collaboration between David Nobbs and Peter Tinniswood - at the time both submitting scripts to That Was the Week That Was - set in a "somewhat stately home somewhere in England" called Hardluck Hall. Nobb's, writing in his autobiography I Didn't Get Where I Am Today, has only a little to offer in the way of enlightenment about the series: "Peter and I achieved two other distinctions. We wrote the first comedy ever to be on BBC Radio's Third Programme. We also wrote the last comedy series ever to be on BBC Radio's Third Programme. You've guessed it. It was the same one. Hardluck Hall - shades of my beloved Thomas Love Peacock - was satirical. The names of the characters - Priscilla Houseproud, Sir Sidney Servall, Tom Ology, Robin Robot, Doreen Nylon - fill me with dismay now, but it was better than it sounds, expolited radio techniques inventively, and was great fun to do. A splendid cast, including Valentine Dyall, Hugh Burden and Stephen Moore, seemed to enjoy it hugely. Peter, of course, went on to do a lot of marvellous radio work. The producer, Richard Thomas, emigrated to new Zealand, but I don't think it was as a direct result of the series". David Nobbs may have been wrong on one account but he did, to my knowledge, write the last comedy for the Third as Radio 3 came along in 1967, though the label for the evening's listening still stuck until April 1970. 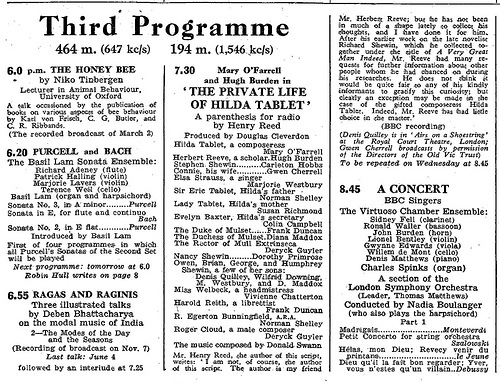 The Third/Radio 3 seemed to relish the cod biography, see Hilda Tablet above and The Atkinson People below. This three part series, tucked away on Monday nights in November 1969, was written by Myles Rudge and starred Kenneth Williams, Joan Sims and John Moffatt. The script for the second programme, a tribute to that fine thespian Plantagenet Runciman, is available online. For once Kenneth Williams was not too scathing about this show. In his diary entry for 11 September 1968 he records: "To the Gratfon for this radio production. John Simmonds directing. It is called A Bannister Called Freda and again Myles has written a brilliant script and Ted Dicks two marvellous songs. Joan Sims & me playing all the parts & John Moffatt doing the Narrator - superbly. Of course this is a pilot show & we've yet to see if the powers approve it". More send-ups, this time of the Open University, in these two comedy shows that were the precursor to The Burkiss Way. Airing in August and November 1975 it was written by Andrew Marshall, David Renwick and John Mason. Burkiss cast members Chris Emmett and Nigel Rees appeared alongside Timothy Davies and Christine Ozanne. According to Rees "Burkiss derived some of its half-academic, half-popular tone from the Radio 3 series". This 4-part 1979 series saw the pre-Blackadder pairing of Rowan Atkinson and Richard Curtis as they took "satirical and wry investigations into the lives of fictional great men". Unlike most of the programmes in this list this series is available to buy and gets repeated on BBC Radio 4 Extra. There'll be more on one of my all-time favourite comedies - this an 8-part tale of a university lecturer in English Literature struggling with his students and his marriage - in a future post. This 'suite in six parts' detailed "the adventures of a hapless young musicologist, who discovers some lost music by a composer 40 years dead but still living on as a malign influence, a sardonic witness to our hero's scholastic endeavours." The series was written by Colin McLaren, at the time the Archivist and Keeper of Manuscripts to the Special Collections department at Aberdeen University, as well as the author of a number of novels, radio monologues and short plays - including the series 39 and Counting (1981) with Michael Hordern, Dinsdale Landen and Hannah Gordon. This is the first part of Broomhouse Reach as heard on Radio 3 on 23 November 1984. It stars David de Keyser as the composer Martin Mendl with Timothy Davies as Timothy Liripet, Cyril Luckham as Sir Hubert Fiske, Fanny Carby as Mrs Wix and Mark Jones as Nigel Scrote. The series was directed by Piers Plowright. This is my recording of that programme, not heard since its first outing. I won't attempt to list all the comedy plays that appeared on the Third and Radio 3 and I can't vouch for the comedic value of most of these productions; the only one I've heard recently is Outpatient. Amongst the works of Rhys Adrian are: No Charge for Extra Service (1979) with Elizabeth Spriggs and Nigel Stock, Watching the Plays Together (1982) with Rosemary Leach and James Grout, Outpatient (1985) with Michael Aldridge and Andrew Sachs, Toytown (1987) with Peter Vaughan, Upended (1988) with Norman Bird and Eva Stuart and Why Leo? (1988) with Richard Briers. Cartoonist Mel Calman wrote The Big Novel (1986) with Richard Griffiths and Peter Woodthorpe. Griffiths was also in the surreal Sweet Tooth (1987) in which Calman "wrote parts for a collection of cakes and pastries" and then in 1989 Rabbit Man with Jim Broadbent playing a taxi driver who grows rabbit's ears. One of Wally K Daly's earliest plays was also on Radio 3: Priest and Confessor (1975) starred Richard Briers and the priest and Tony Haygarth as the man making his first confession for many years. This 1994 series of five programmes was Peter Cook's swansong in which he again donned the persona of Sir Arthur Streeb-Greebling, "the complacent aristocrat who'd wasted his whole life trying to teach ravens to fly underwater". Like the BBC2 series A Life in Pieces (1990/91) the premise was that Sir Arthur was reminiscing in a two-way interview; on TV it was Ludovic Kennedy but for the radio series he was more evenly matched with Chris Morris. 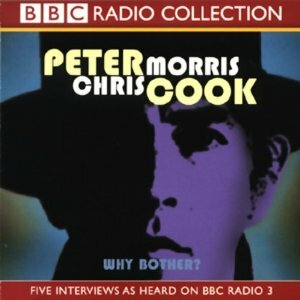 According to William Cook, editor of a Peter Cook anthology, Morris "left Cook enough space to land his punchlines, but Morris also created a proper character of his own". All five editions are on YouTube. Thank you for this post - it led me to spending the next few days listening to all the Hilda Tablet plays on Youtube. They were wonderful! So many thanks for intelligent and humourous pieces, especially broomhouse reach. Thank god for people like you !! Who agrees with robin Holloway that Tippett's work after 2nd symphony. Concerto for orchestra. And two marvellous song cycles went very wonky !! Steven Johnson wrote/presented wonderful short talk on 2ndsymph.